The award recognises leaders who champion the green building movement and “raise the bar when it comes to creating healthier, more sustainable buildings and communities”. In addition to Knauf Insulation, a Leadership Award was also presented to adidas in recognition of a “holistic sustainability strategy” that includes a commitment to LEED, reducing the company’s carbon footprint and the campaign ‘Sport Needs a Space’. President and CEO of USGBC and Green Business Certification, Inc (GBCI), Mahesh Ramanujam said: “Knauf Insulation serves as a model for the international community. Your commitment to corporate social responsibility and improving the quality of life is an inspiration. 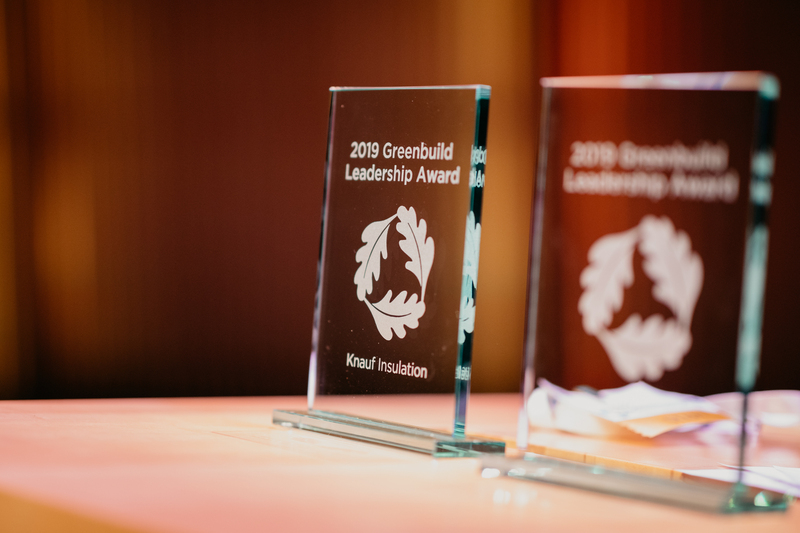 The award was received on behalf of Knauf Insulation by our Sustainability and Product Regulatory Affairs Director Vincent Briard at Greenbuild Europe, an annual USGBC forum for sustainable building experts held this year in Amsterdam. “Our company has always been committed to the creation of better buildings for a more sustainable environment and I am delighted to receive this award in recognition of the hard work of everyone at Knauf Insulation,” said Vincent. During Greenbuild, Vincent also participated in a seminar to discuss the European Commission’s building pilot project Level(s) which aims to ‘mainstream’ building sustainability by understanding the environmental impact of buildings throughout their lifecycle. Our Knauf Insulation Experience Center in Slovenia has been contributing data to this project since 2017. As a key sponsor of Greenbuild, Knauf Insulation also supported seminars on issues such as building emission assessments, environmental, social and governance data, the impact of LEED in Sweden, building resilience, digital technologies and the new LEEDv4.1.